Discreet, elegant, Burgundy-esque in its perfume and laciness. 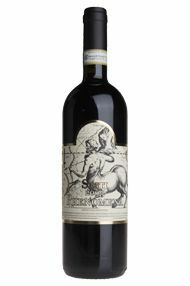 Was bottled in February 2012 and is already showing a lovely volume of soft summer fruit, languid, with immense charm. The 100% Sangiovese wine being aged in a combination of 700 - 3300 litre oak barrels for three years. 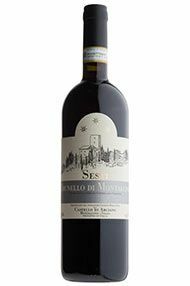 This Sesti Brunello di Montalcino, bottled in February 2014, was tasted late Jan 2015. 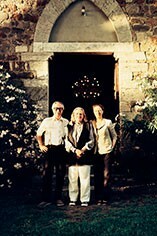 Gigi Elisa both pointed out that 2010 was remarkable not just for the quality of the wines but also of the olive oil. Sporting the telltale ‘terra di Argiano’ iron-red ochre colour, their incense-rich, soft, dark quinine, liquorice nutmeg perfumed Brunello is incredibly compact restrained, giving little away still. It has great presence, combining fleshiness with structure, refined, sleek even, cool quinine flavours, sunny, softly-spoken penetrating. ‘Al dente’ with a wonderful raspberry zip, and profound minerality (the result of ancient sedimentary marine life).